Incredible mixture of steep crack and face. May want a thin nut or cam between second and third bolt. Another little crux above fourth bolt, then slightly overhanging 5.9 jamming to two-bolt anchor. FA: Petch Pietrolungo, Brent Kuemerle. Which SuperTopo guidebooks include a topo for Rehab? Route E in the photo. 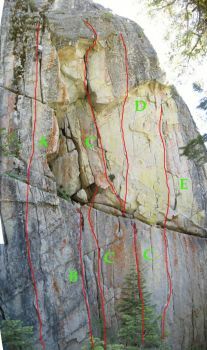 Route C in the photo.